Diablo (SS-479) was launched 1 December 1944 by Portsmouth Navy Yard; sponsored by Mrs. V. D. Chapline; and commissioned 31 March 1945 Lieutenant Commander G. G. Matherson in command. Diablo arrived at Pearl Harbor from New London 21 July 1945. She sailed for her first war patrol 10 August with instructions to stop at Saipan for final orders. With the cease fire her destination was changed to Guam where she arrived 22 August. On the last day of the month she got underway for Pearl Harbor and the east coast arriving at New York 11 October. Except for a visit to Charleston S.C. in October she remained at New York until 8 January 1946. From 15 January 1946 to 27 April 1949 Diablo was based in the Canal Zone participating in fleet exercises and rendering services to surface units in the Caribbean. During 23 August-2 October 1947 she joined Cutlass (SS-478) and Conger (SS-477) for a simulated war patrol down the west coast of South America and around Tierra del Fuego. The three submarines called at Valparaiso Chile in September while homeward bound. Diablo sailed to Key West Fla. for antisubmarine warfare exercises from 16 November to 9 December 1947 and operated from New Orleans for the training of naval reservists in March 1948. Diablo arrived at Norfolk her new home port 5 June 1949 and alternated training cruises with duty at the Sonar School at Key West. Her home port became New London in 1952 and she arrived there 17 September to provide training facilities for the Submarine School. From 3 May to 1 June 1954 she was attached to the Operational Development Force at Key West for tests of new weapons and equipment. 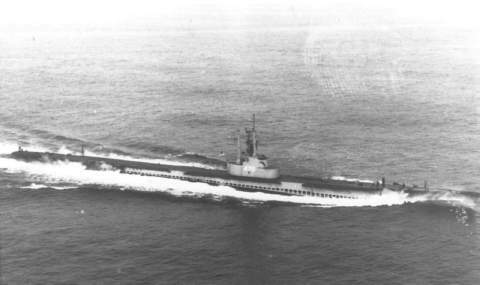 She participated in Operation "Springboard" in the Caribbean during 21 February-28 March 1955 and continued to alternate service with the Submarine School with antisubmarine warfare and fleet exercises in the Caribbean and off Bermuda as well as rendering services to the Fleet Sonar School and Operational Development Force at Key West. Between February and April 1959 she cruised through the Panama Canal along the coasts of Colombia, Ecuador, Peru, and Chile for exercises with South American navies.